Do you no wear my sun is? Does the above dialogue make sense to you? If not, read it aloud. ’No’ is pronounced just like ’know’, ’wear’ is just like ’where’, and so on. Words like these – that are pronounced the same, but differ in meaning – are called homophones. You might not pay too much attention to them while speaking, however, when it comes to writing, you may end up making some funny mistakes if you mix up two homophones that are spelled differently. Thank you for the fantastic dinner. It was lovely to meat your wife. Can you spot the mistake? I hope you won’t make it the next time you want to send a thank you card. In the following lesson, you’ll find sentences and pictures (thanks to Pablo Stanley and Kaplan International. 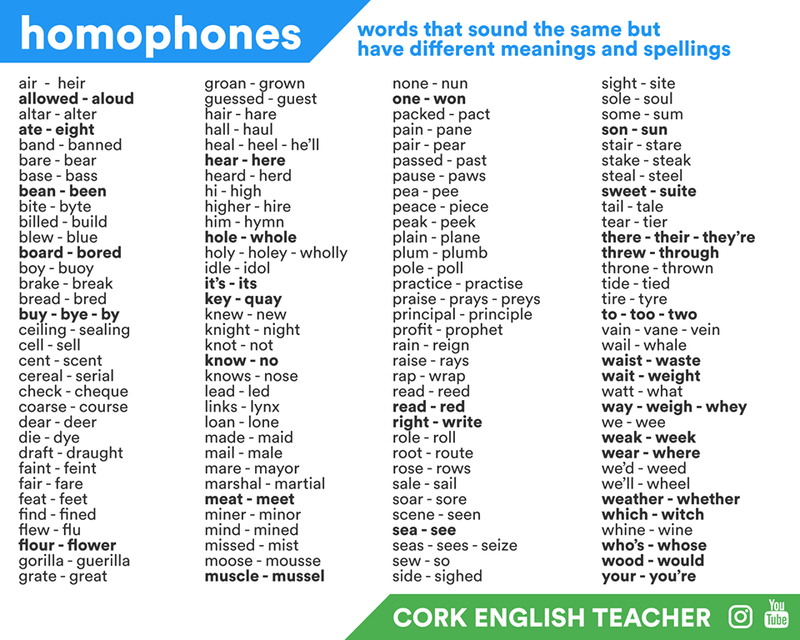 You can check the original images here and here and also discover how you can study English abroad) to help you remember how to spell some of the most common homophones. It’s spring. Love is in the air and the birds are singing. When the new royal heir is born, hundreds of balloons are sent up in the air to celebrate the event. An aisle seat, please. I wouldn’t like to sit next to the window, I’m afraid of heights. They’re planning to build an airport on the isle. I think it’s a fantastic idea. Will you love me if I go bald? Don’t worry. Look at how handsome Bruce Willis is. And he is bald. When I realized I was going bald, I bawled liked a child. I don’t want to look like Captain Picard from Star Trek. You shouldn’t have bawled so hard. Captain Picard is really cool. I’d like to form a rock band. Can you play any musical instruments? I’d love to be in a rock band, but I thought you were banned from playing loud music in the house. Susy was wearing a daring dress at the party. It revealed her bare legs. I took my son to the zoo to see the new baby bear. He loved it. I think I’ll get him a Teddy bear for his next birthday. I’d like to be famous one day. I wonder what it’s like to be a bee. Bees seem to be working all day. You’ll break something if you keep playing football in the living room. Can you stop it, please? I’ll have to get my brakes checked. I think there’s something wrong with them. Is the garage open on Sunday? I don’t want you to crash the car. I’m bored with you. Are homophones the only thing you can talk about? a flat piece of wood on which you can write, play a game or do sports like surfing, skateboarding etc. Whenever the teacher goes to the whiteboard and writes something on it, the students start chatting. I’d like to buy a piano, but my husband doesn’t really like the idea. Do you go to work by car? No, I can’t drive. I always go by train. I’ve decided to sell my house and move to Australia. They don’t deserve a cent after what they have done to you. Could you feel the scent of jasmine in the garden? It was so lovely. I’m not sure if I should trim my cat’s rear claws. Do you know anything about cats? Don’t sign that contract before you read and understand every word and clause! Yes, I am. My current employer is much nicer than the previous one. Would you like some ice-cream with your blackcurrants? I’d love some, thanks. Ice-cream and currants are my idea of heaven. You are my dearest friend, you know. Am I? You’re dear to me as well. I had venison steak for lunch. Oh dear, you don’t know? It’s deer meat. My dog’s very old. I’m afraid he’ll die soon. I’m thinking of dying my hair. Should I dye it blue or pink? I think your parents will just die if you show up with pink hair. Right, I’ll dye it blue then. Mum, that’s not fair! I did the washing up yesterday. It’s Jack’s turn today. I can’t visit my parents very often. The train fare is too expensive. If I was a bit younger, I’d flee this boring town and move to the capital. Do you think fleas go into human hair? Well, a flea may jump on it if you’re around animals, but I don’t think it would like it there. Can you buy some flour on your way home? I’d like to make pizza for dinner. Of course I will. I would do anything to have pizza for dinner. You should make your wife breakfast in bed a few times every month. And don’t forget to lay a single flower on the tray before you serve it. Would you like to come trekking with us? We’re going to the Rockies. You must be joking. What will you do if you bump into a grizzly? Did you see those black and white photos in her living room? Yeah, they’re rather grisly, aren’t they? Especially the one with the zombies. Guerrilla warfare has had a big impact on the area. It’s not a safe place to go on holiday anymore. Have you seen the film ’King Kong’? It’s about a giant gorilla that is taken to New York to be exhibited. Her hair used to be much shorter. Do you think she’s got hair extensions? Rabbits live underground, but hares live in overground nests. Can I get a pet hare? How long will this wound take to heal? I hurt my left heel while playing football. I hope it will heal soon. My favourite heroine is Hermione Granger from the Harry Potter books. I stopped reading that book when the heroine turned out to be a heroin addict. I don’t like stories about drug addicts. They’re so sad. The Christian holy book is called the Bible. The dress she was wearing to church was wholly inappropriate. Humerus fractures usually heal without surgery, but you may have to wear a shoulder sling for a couple of weeks. I write humorous stories for children in my free time, but my daughter doesn’t seem to like them at all. Aretha Franklin is my idol. She’s such a fantastic singer. Peter’s such an idle child. He never does his homework and doesn’t pay attention in class at all. I love living in this town. I can spend hours just watching the people go by. We usually stay in this inn when we are visiting my parents. It’s the best inn in town. My son can tie his shoelaces by himself now. He tied his first ever knot last week. I do not remember when my daughter learnt how to tie a knot. She was not as young as your son. I made a cake for my husband’s birthday. I think I’ll hire a maid. I can’t do everything myself, can I? I feel really unsocial in the morning until I have my first coffee. It’s not the best time to talk to me about important things. In my country, women wear black clothes during the mourning period. Arnold Schwarzenegger is really muscular. Have you seen his muscles? They’re huge like mountains. I saw Arnold Schwarzenegger in a restaurant last night. He was eating mussels with bare hands. Where were you last night? I waited up for you until 2am. You shouldn’t be out so late at night. Mum, I was in bed all night. Why didn’t you knock on my door? Why don’t you go out with Jack? You can’t wait for a knight in shining armor forever. I’m not waiting for a knight, but I definitely need someone more reliable than Jack. None of the students wanted to go to the museum, so we ended up feeding the pigeons on the square. Why did Mother Teresa become a nun? She just liked helping people, I guess. Our house is the nicest in the street. It takes an hour to get to our house from here. I need a new pair of shoes. Will you come with me to help me choose? Would you like to stay for tea? I’m making pear tarts. I’ve never tried pear tarts. Are they as good as apple tarts? You’d better stop kicking your sister. I’m losing my patience and you don’t want to find out what happens when I’ve lost it. I’ve got so many patients to visit today. I’m not sure if I’ll have the patience to listen to all of them. But Dr Brown, there are only two more patients left. Let’s pause the film. I want to go to the kitchen to get more popcorn. My cat puts her paws gently on my face every morning to wake me up. It’s lovely, but she never seems to notice how early it is. Here, have a piece of apple pie. I made it myself. I wish there was peace on Earth. I like all kinds of chocolate. Chocolate with nuts, chocolate with fruit, chocolate with cream filling or just plain chocolate. I’m not afraid of flying, but I really don’t like sitting in a plane for hours. It’s so boring. Poor Jackie! She didn’t pass the exam, even though she had studied a lot. You poor thing! You must be freezing, it’s so cold outside. Come in, let me pour you some nice, hot tea. Do you think there are any modern day prophets? Do we still need prophets? A lot of companies are more interested in profits than the safety of their workers. I’d like to sail through the Mediterranean. Do you want to come with me? Ted’s house is for sale. I wonder where he’s going to move once it’s sold. I saw Glenn at the post office yesterday, but she didn’t see me. Have you seen my saw? I’d like to make a house for the dog. I like that website. I can watch my favourite TV serials there online. I’m so happy, I could kiss you. Thanks a lot for the lovely present. I love designing clothes, but I can’t sew. Why don’t you learn how to sew? I’d be so glad to wear the clothes you make. Do you like my painting? I put my heart and soul in it. Well, I can see some paint there on a canvas, but I can’t see your heart and soul anywhere. I’d like to make something light for dinner. Have you got any sole recipes? The soles of their feet were nearly black with dirt. She got extremely upset when I told her. She was just standing there with her hands on her waist and didn’t say a word. Let’s not waste more time on this subject. We’ve said everything that can be be said. Will you wait here until I get back? I won’t be long. Do you think I should lose some weight? No, I don’t. I actually think you need to put on some weight- you’re too thin. A glass of red wine before bed is good for your heart. Don’t whine! I won’t give you more wine unless you stop whining. How old were you when you learnt to write? I was three years old.Three? That’s right. I was only three when I learnt to write. And don’t forget, you can always use spell/grammar checkers to instantly proofread your writing. I hope you’ve found this lesson interesting and you’re not board. Umm, I mean bored. Remember, these are mistakes that spell checkers won’t recognize, so pay extra attention to homophones when writing. If you have any questions, feel free to ask in the comment area below. We are hear two help. I mean, we are here to help.